Mayank Pareek, the president of Tata Motors’ passenger vehicle business, received a mail from a prospective buyer of the newly-launched Hexa in Mumbai who said he would like to evaluate the SUV but his wife was not sure. Pareek did not lose time and had a Hexa sent to this prospect for a week. The person was not too keen to accept it as he was travelling to Nashik. But Pareek insisted that he must take the car along. A week later, the prospect turned into a customer. Tata Motors had started off as a commercial vehicle maker in the 1950s and ventured into passenger vehicles in the 1990s with cars like the Sumo and Indica. 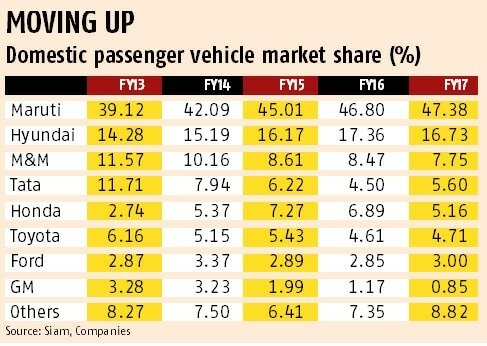 With its Indica and Indigo cars becoming a hit in the taxi segment, the company clocked large volumes and enjoyed a high market share of 17 per cent in 2004-05. Since then, its share has fallen by two-thirds, though in a rapidly-growing market. Tata Motors’ small car, the Nano, touted as the world’s cheapest car, did not live up to the expectations in spite of several makeovers and could soon be on its way out. The taxi segment, its mainstay, steadily changed its loyalty and now thrives on cars from Maruti Suzuki, Honda and Hyundai, among others. A much-touted partnership with Fiat spluttered and subsequently folded up. Now, the company has identified ways to improve its position. It has a new product strategy that wants to cater more to the personal user segment and not the taxi owners. This is evident in the last three launches — the Tiago, Hexa and Tigor — which are meant for personal use. The year-old Tiago, which has established itself in the entry-segment hatchback market, helped the company grow domestic volumes 22 per cent to 153,151 units in FY17. Tata Motors’ current product portfolio addresses only 59 per cent of the market. Enhancing the coverage will be the key. “We are not there in compact SUVs, and we are not there in hot hatches, vans, bigger sedans, larger SUVs,” says Pareek. “Our strategy is to start covering more segments. We also believe some new segments will emerge. 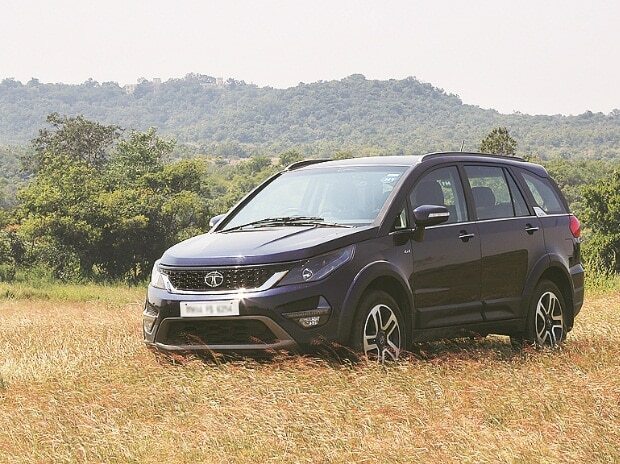 The trick is to anticipate such segments and work on it.” By 2019, with a string of new products (compact SUVs, larger sedans, vans, etc), Tata Motors hopes to cover 95 per cent of the market. At the same time, it also wants to spread its network. “Today, we are present in around 630 outlets. We will expand it to 1,500 by 2019-20,” says Pareek. But merely expanding network and having more products does not work. Tata Motors therefore wants to improve the customer experience at its dealerships. “We are actively looking at changing the look of showrooms completely. They will be redesigned like a lounge. The first such showroom is expected this year,” adds Pareek. It is worth noting that Maruti Suzuki, the country’s biggest car maker, launched the Nexa, a new marketing network with lounge like showroom to cater to premium buyers in 2015. This has helped the company get a foothold in the executive segment of the market, which had eluded it totally so far. According to Pareek, even when one buys a thousand-rupee shirt from a mall, the experience is better than in a car showroom. “We want to revisit the selling process and do more of engagement marketing. There should be no use of high pressure sales tactic from salespersons at the showrooms,” he says. The company wants to go for high-tech at the dealerships to enhance customer experience. Many dealerships have started recruiting people from hospitality and aviation. “They have a concept of service to customers. We are also training the existing people at dealerships,” says Pareek. In the past, some dealers had exited the brand due to weak prospects. Pareek says the financial performance of dealerships is getting better. The company also wants to expand its network of pre-owned cars to help new sales. Industry veterans say there is a momentum at Tata Motors’ passenger vehicle business. “There has been a vast improvement in the quality of products introduced by Tata Motors in recent times. Jaguar-Land Rover’s support in (product) development has helped. It is important that customers across are made aware of it. Revitalised dealership will play a critical role in this effort,” says Jagdish Khattar, former managing director at Maruti Suzuki and promoter of Carnation. To move up the tech value chain, the company has created a sub-brand called TAMO. It will offer products with technologies that are ahead of the market and when proven successful, they could be transferred to vehicles of the main Tata Motors brand. Some experts also believe that the company should look at using TAMO for the entire passenger vehicle range so that it stands out from the commercial vehicle business. The company last month partnered with Volkswagen, and its group company, Škoda, to jointly develop vehicles, targeted at emerging markets, including India, beginning 2019. “We strongly believe that both companies, by working together, can leverage from each other’s strengths to create synergies and develop smart, innovative solutions for the Indian and overseas market,” says Tata Motors Managing Director Guenter Butschek. Tata Motors probably realises the need to have an expanded technology and design platform to compete with the global majors who are also turning aggressive in the Indian market. Maruti Suzuki’s parent, Suzuki Motor Corporation, has partnered with Toyota and this will have implications for India, which happens to be Suzuki’s biggest market. SAIC (China’s top carmaker), Korean carmaker Kia and French PSA are readying plans to enter India, implying more competition for the incumbents. In order to be fit for the future, Tata Motors is working on a leaner organisation and plans to reduce the wage bill. It is trying to bring down the number of platforms used for cars and create economies. It is also trimming its supplier base of several hundred by removing those who have not delivered on quality, delivery and cost competitiveness. It could well be the strongest comeback in the history of the Indian car industry.